Ferit Orhan Pamuk (generally known simply as Orhan Pamuk; born 7 June 1952) is a Turkish novelist, screenwriter, academic and recipient of the 2006 Nobel Prize in Literature. One of Turkey's most prominent novelists, his work has sold over thirteen million books in sixty-three languages, making him the country's best-selling writer. Pamuk is the author of novels including Silent House, The White Castle, The Black Book, The New Life, My Name Is Red, Snow, The Museum of Innocence, and A Strangeness in My Mind. He is the Robert Yik-Fong Tam Professor in the Humanities at Columbia University, where he teaches writing and comparative literature. He was elected to the American Philosophical Society in 2018. Of partial Circassian descent and born in Istanbul, Pamuk is the first Turkish Nobel laureate. He is also the recipient of numerous other literary awards. My Name Is Red won the 2002 Prix du Meilleur Livre Étranger, 2002 Premio Grinzane Cavour and 2003 International Dublin Literary Award. The European Writers' Parliament came about as a result of a joint proposal by Pamuk and José Saramago. In 2005, the ultra-nationalist lawyer Kemal Kerinçsiz sued Pamuk over his statement regarding the Armenian Genocide in the Ottoman Empire. His intention, according to Pamuk himself, had been to highlight issues relating to freedom of speech in the country of his birth. The court initially declined to hear the case, but in 2011 Pamuk was ordered to pay 6,000 liras in total compensation for having insulted the plaintiffs' honor. Pamuk was born in Istanbul, in 1952, and he grew up in a wealthy yet declining upper-class family; an experience he describes in passing in his novels The Black Book and Cevdet Bey and His Sons, as well as more thoroughly in his personal memoir Istanbul. Pamuk's paternal grandmother was a Circassian. He was educated at Robert College secondary school in Istanbul and went on to study architecture at the Istanbul Technical University since it was related to his real dream career, painting. He left the architecture school after three years, however, to become a full-time writer, and graduated from the Institute of Journalism at the University of Istanbul in 1976. From ages 22 to 30, Pamuk lived with his mother, writing his first novel and attempting to find a publisher. He describes himself as a Cultural Muslim who associates the historical and cultural identification with the religion while not believing in a personal connection to God. He started writing regularly in 1974. His first novel, Karanlık ve Işık (Darkness and Light) was a co-winner of the 1979 Milliyet Press Novel Contest (Mehmet Eroğlu was the other winner). This novel was published with the title Cevdet Bey ve Oğulları (Mr. Cevdet and His Sons) in 1982, and won the Orhan Kemal Novel Prize in 1983. It tells the story of three generations of a wealthy Istanbul family living in Nişantaşı, the district of Istanbul where Pamuk grew up. Pamuk won a number of critical prizes for his early work, including the 1984 Madarali Novel Prize for his second novel Sessiz Ev (Silent House) and the 1991 Prix de la Découverte Européenne for the French translation of this novel. His historical novel Beyaz Kale (The White Castle), published in Turkish in 1985, won the 1990 Independent Award for Foreign Fiction and extended his reputation abroad. On May 19, 1991, The New York Times Book Review stated, "A new star has risen in the east—Orhan Pamuk." He started experimenting with postmodern techniques in his novels, a change from the strict naturalism of his early works. Popular success took a bit longer to come to Pamuk, but his 1990 novel Kara Kitap (The Black Book) became one of the most controversial and popular books in Turkish literature, due to its complexity and richness. In 1992, he wrote the screenplay for the movie Gizli Yüz (Secret Face), based on Kara Kitap and directed by a prominent Turkish director, Ömer Kavur. Pamuk's fifth novel Yeni Hayat (New Life) caused a sensation in Turkey upon its 1994 publication and became the fastest-selling book in Turkish history. By this time, Pamuk had also become a high-profile figure in Turkey, due to his support for Kurdish political rights. In 1995, Pamuk was among a group of authors tried for writing essays that criticized Turkey's treatment of the Kurds. In 1999, Pamuk published his book of essays Öteki Renkler (Other Colors). Pamuk's international reputation continued to increase when he published Benim Adım Kırmızı (My Name is Red) in 1998. The novel blends mystery, romance, and philosophical puzzles in a setting of 16th century Istanbul. It opens a window into the reign of Ottoman Sultan Murat III in nine snowy winter days of 1591, inviting the reader to experience the tension between East and West from a breathlessly urgent perspective. My Name Is Red has been translated into 24 languages and in 2003 won the International Dublin Literary Award, the world's most lucrative literary prize. Nothing changed in my life since I work all the time. I've spent 30 years writing fiction. For the first 10 years, I worried about money and no one asked how much money I made. The second decade I spent money and no one was asking about that. And I've spent the last 10 years with everyone expecting to hear how I spend the money, which I will not do. Pamuk followed this with the novel Kar, published in 2002 (English translation: Snow, 2004). Set in the border city of Kars, it explores the conflict between Islamism and Westernism in modern Turkey. Snow follows Ka, an expatriate Turkish poet, as he wanders around the snowy Kars and gets caught up in the muddle of aimless Islamists, MPs, headscarf advocates, secularists, and a number of factions who die and kill in the name of highly contradictory ideals. The New York Times listed Snow as one of its Ten Best Books of 2004. I strongly feel that the art of the novel is based on the human capacity, though it’s a limited capacity, to be able to identify with “the other.” Only human beings can do this. It requires imagination, a sort of morality, a self-imposed goal of understanding this person who is different from us, which is a rarity. In May 2007, Pamuk was among the jury members at the Cannes Film Festival headed by British director Stephen Frears. He completed his next novel, Masumiyet Müzesi (The Museum of Innocence) in the summer of 2008 - the first novel he published after receiving the 2006 Nobel Prize in Literature. Pamuk created an actual Museum of Innocence, consisting of everyday objects tied to the narrative, and housed them at an Istanbul house he purchased. Pamuk collaborated on a documentary "The Innocence Of Memories"  that expanded on his Museum of Innocence. Pamuk stated that "(Museum of Dreams will) tell a different version of the love story set in Istanbul through objects and Grant Gee’s wonderful new film". In both Snow and the Museum of Innocence Pamuk describes tragic love-stories, where men fall in love with beautiful women at first sight. It has been noted[by whom?] that Pamuk's portrayals of women and the reasons men fall in love with them are powerful in their intensity, yet superficial in the way these love stories originate. Pamuk's heroes tend to be educated men who fall tragically in love with beauties, but who seem doomed to a decrepit loneliness. In 2013, Pamuk invited Grazia Toderi, whose work he admired, to design a work for the Museum of Innocence in Istanbul. Their collaboration culminated in the exhibition Words and Stars. Words and Stars opened on April 2, 2017, at the MART (Museo di Arte Moderna e Contemporanea di Trento e Rovereto), and which explores "the inclination of man to explore space and innate vocation to question the stars." The show was curated by Gianfranco Maraniello. It also showed from November 4, 2016 to March 29, 2017 from 5–6 November 2016 at the Palazzo Madama, Piazza Castello, Turin, and at Infini-to, the Planetarium of Turin (Infini.to - Planetario di Torino, Museo dell'Astronomia e dello Spazio) by invitation. Pamuk’s tenth novel, The Red-Haired Woman (2016) is the story of a well-digger and his apprentice looking for water on barren land. It is also a novel of ideas in the tradition of the French conte philosophique. In mid-1980s Istanbul, Master Mahmut and his apprentice use ancient methods to dig new wells; this is the tale of their back-breaking struggle, but it is also an exploration—through stories and images—of ideas about fathers and sons, authoritarianism and individuality, state and freedom, reading and seeing. This short, compelling novel is at once a realist text investigating a murder which took place thirty years ago near Istanbul, and a fictional inquiry into the literary foundations of civilizations, comparing two fundamental myths of the West and the East respectively: Sophocles’s Oedipus Rex (a story of patricide) and Ferdowsi’s tale of Rostam and Sohrab (a story of filicide). Throughout runs the demonic voice of the eponymous red-haired woman. Pamuk published a memoir/travelogue Istanbul—Hatıralar ve Şehir in 2003 (English version, Istanbul—Memories and the City, 2005). Pamuk's Other Colours – a collection of non-fiction and a story — was published in the UK in September 2007. I thought I would write Memories and the City in six months, but it took me one year to complete. And I was working twelve hours a day, just reading and working. My life, because of so many things, was in a crisis; I don’t want to go into those details: divorce, father dying, professional problems, problems with this, problems with that, everything was bad. I thought if I were to be weak I would have a depression. But every day I would wake up and have a cold shower and sit down and remember and write, always paying attention to the beauty of the book. Honestly, I may have hurt my mother, my family. My father was dead, but my mother is still alive. But I can’t care about that; I must care about the beauty of the book. Pamuk's books are characterized by a confusion or loss of identity brought on in part by the conflict between Western and Eastern values. They are often disturbing or unsettling, and include complex plots and characters. His works are also redolent with discussion of and fascination with the creative arts, such as literature and painting. Pamuk's work often touches on the deep-rooted tensions between East and West and tradition and modernism/secularism. "I am just listening to an inner music, the mystery of which I don't completely know. And I don't want to know." "I am most surprised by those moments when I have felt as if the sentences, dreams, and pages that have made me so ecstatically happy have not come from my own imagination – that another power has found them and generously presented them to me." A group of writers assert that some parts of Pamuk's works are heavily influenced by works of other writers, and some chapters are almost totally quoted from other books. Pamuk himself said that his works have been inspired by the writings of rebel poet Kazi Nazrul Islam. One of the writers, nationalist popular-historian Murat Bardakçı, accused him of counterfeiting and plagiarism in the Hurriyet, a Turkish newspaper. Another accusation is that Pamuk's novel The White Castle contains exact paragraphs from Fuad Carim's Kanuni Devrinde İstanbul ("Istanbul in the Time of the Kanuni") novel. After a question raised at the 2009 Boston Book Festival as to whether he wanted to respond to these accusations, Pamuk responded, "No I do not. Next question?". However, many attributed such accusations to their ignorance about postmodern literature, and the literary technique of intertextuality which Pamuk almost always uses in his novels in full disclosure. Pamuk's elder brother Şevket Pamuk, who sometimes appears as a fictional character in Orhan Pamuk's work, is a professor of economics, internationally recognised for his work in history of economics of the Ottoman Empire, working at Bogazici University in Istanbul. Pamuk also has a younger half-sister Hümeyra Pamuk, who is a journalist. On 1 March 1982, Pamuk married Aylin Türegün, a historian. From 1985 to 1988, while his wife was a graduate student at Columbia University, Pamuk assumed the position of visiting scholar there, using the time to conduct research and write his novel The Black Book in the university's Butler Library. This period also included a visiting fellowship at the University of Iowa. Pamuk returned to Istanbul, a city to which he is strongly attached. He and his wife had a daughter named Rüya (born 1991), whose name means "dream" in Turkish. In 2001, they were divorced. In 2006, Pamuk returned to the U.S. to take a position as a visiting professor at Columbia, where he was a Fellow with Columbia's Committee on Global Thought and held an appointment in Columbia's Middle East and Asian Languages and Cultures department and at its School of the Arts. In the 2007–2008 academic year Pamuk returned to Columbia to jointly teach comparative literature classes with Andreas Huyssen and David Damrosch. Pamuk was also a writer-in-residence at Bard College. In autumn 2009, Pamuk was Harvard's Charles Eliot Norton Lecturer, delivering a series of lectures entitled "The Naive and Sentimental Novelist". Orhan publicly acknowledged his relationship with Kiran Desai, Booker prize winner of Indian origin. In January 2011, Turkish-Armenian artist Karolin Fişekçi told Hürriyet Daily News that Pamuk had a two-and-a-half-year relationship with her during the same time (2010–12), a statement expressly denied by Pamuk. In an interview with Simon Schama published in the Financial Times on Aug 16 2013, Schama mentions Pamuk's girlfriend Asli. Aslı Akyavaş is thought to be his current girlfriend. José Saramago, Gabriel García Márquez, Günter Grass, Umberto Eco, Carlos Fuentes, Juan Goytisolo, John Updike and Mario Vargas Llosa issued a joint statement in support of Pamuk when he was put on trial in Turkey. In 2005, after Pamuk made a statement regarding the Armenian Genocide and mass killings of Kurds, a criminal case was opened against the author based on a complaint filed by ultra-nationalist lawyer Kemal Kerinçsiz. The charges were dropped on 22 January 2006. In Bilecik, his books were burnt in a nationalist rally. Pamuk has subsequently stated his intent was to draw attention to freedom of speech issues. However, Kemal Kerinçsiz, the lawyer who had originally pressed charges against Pamuk, appealed to the Supreme Court of Appeal which ordered the court in Şişli to re-open the case. On March 27, 2011, Pamuk was found guilty and ordered to pay 6,000 liras in total compensation to five people for, among others, having insulted their honor. The criminal charges against Pamuk resulted from remarks he made during an interview in February 2005 with the Swiss publication Das Magazin, a weekly supplement to a number of Swiss daily newspapers: the Tages-Anzeiger, the Basler Zeitung, the Berner Zeitung and the Solothurner Tagblatt. In the interview, Pamuk stated, "Thirty thousand Kurds have been killed here, and a million Armenians. And almost nobody dares to mention that. So I do." Turkish historians were divided over the remarks. Pamuk stated that he was consequently subjected to a hate campaign that forced him to flee the country. He returned later in 2005, however, to face the charges against him. In an interview with BBC News, he said that he wanted to defend freedom of speech, which was Turkey's only hope for coming to terms with its history: "What happened to the Ottoman Armenians in 1915 was a major thing that was hidden from the Turkish nation; it was a taboo. But we have to be able to talk about the past." However, when Turkish television, CNN TURK asked Pamuk about his speech, he admitted that he said that "Armenians were killed" but he rejected that he said "Turks killed Armenians" and he estimated the number of deaths (as 1 million) in that speech. At the time, Article 301 of the Turkish Penal Code stated: "A person who publicly insults the Republic or Turkish Grand National Assembly, shall be punishable by imprisonment of between six months to three years." Pamuk was charged with violating this law in the interview. In October, after the prosecution had begun, Pamuk reiterated his views in a speech given during an award ceremony in Germany: "I repeat, I said loud and clear that one million Armenians and 30,000 Kurds were killed in Turkey." Article 301's old form before 2005 (and also the new form after the amendments in 2008) required that prosecution under the article needs to be approved by the Ministry of Justice. A few minutes after Pamuk's trial started on 16 December, the judge found that this approval had not yet been received and suspended the proceedings. In an interview published in the Akşam newspaper the same day, the then Justice Minister Cemil Çiçek said he had not yet received Pamuk's file but would study it thoroughly once it came. On 29 December 2005, Turkish state prosecutors dropped the charge that Pamuk insulted Turkey's armed forces, although the charge of "insulting Turkishness" remained. The charges against Pamuk caused an international outcry and led to questions in some circles about Turkey's proposed entry into the European Union. On 30 November, the European Parliament announced that it would send a delegation of five MEPs led by Camiel Eurlings, to observe the trial. EU Enlargement Commissioner Olli Rehn subsequently stated that the Pamuk case would be a "litmus test" of Turkey's commitment to the EU's membership criteria. On 1 December, Amnesty International released a statement calling for Article 301 to be repealed and for Pamuk and six other people awaiting trial under the act to be freed. PEN American Center also denounced the charges against Pamuk, stating: "PEN finds it extraordinary that a state that has ratified both the United Nations International Covenant on Civil and Political Rights, and the European Convention on Human Rights, both of which see freedom of expression as central, should have a Penal Code that includes a clause that is so clearly contrary to these very same principles." On 13 December, eight world-renowned authors—José Saramago, Gabriel García Márquez, Günter Grass, Umberto Eco, Carlos Fuentes, Juan Goytisolo, John Updike and Mario Vargas Llosa—issued a joint statement supporting Pamuk and decrying the charges against him as a violation of human rights. In 2008, in an open online poll, Pamuk was voted as the fourth most intellectual person in the world on the list of Top 100 Public Intellectuals by Prospect Magazine (United Kingdom) and Foreign Policy (United States). On 22 January 2006, Turkey's Justice Ministry refused to issue an approval of the prosecution, saying that they had no authority to open a case against Pamuk under the new penal code. With the trial in the local court, it was ruled the next day that the case could not continue without Justice Ministry approval. Pamuk's lawyer, Haluk İnanıcı, subsequently confirmed that charges had been dropped. EU enlargement commissioner Olli Rehn welcomed the dropping of charges, saying "This is obviously good news for Mr. Pamuk, but it's also good news for freedom of expression in Turkey". However, some EU representatives expressed disappointment that the justice ministry had rejected the prosecution on a technicality rather than on principle. An Ankara-based EU diplomat reportedly said, "It is good the case has apparently been dropped, but the justice ministry never took a clear position or gave any sign of trying to defend Pamuk". Meanwhile, the lawyer who had led the effort to try Pamuk, Kemal Kerinçsiz, said he would appeal the decision, saying, "Orhan Pamuk must be punished for insulting Turkey and Turkishness, it is a grave crime and it should not be left unpunished." In 2006, the magazine Time listed Pamuk in the cover article "TIME 100: The People Who Shape Our World", in the category "Heroes & Pioneers", for speaking up. 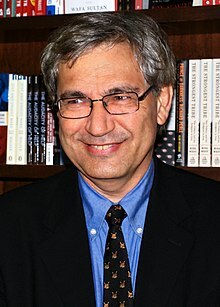 In April 2006, on the BBC's HARDtalk program, Pamuk stated that his remarks regarding the Armenian Genocide were meant to draw attention to freedom of expression issues in Turkey rather than to the massacres themselves. On 19–20 December 2006, a symposium on Orhan Pamuk and His Work was held at Sabancı University, Istanbul. Pamuk himself gave the closing address. In January 2008, 13 ultranationalists, including Kemal Kerinçsiz, were arrested by Turkish authorities for participating in a Turkish nationalist underground organisation, named Ergenekon, allegedly conspiring to assassinate political figures, including several Christian missionaries and Armenian intellectual Hrant Dink. Several reports suggest that Pamuk was among the figures this group plotted to kill. The police informed Pamuk about the assassination plans eight months before the Ergenekon investigation. On 12 October 2006, the Swedish Academy announced that he had been awarded the 2006 Nobel Prize in Literature, confounding pundits and oddsmakers who had concluded that Syrian poet Ali Ahmad Said, known as Adunis, was most likely to receive that year's award. There were concerns within Turkey that the decision to award the Nobel Prize to Pamuk was politically motivated. In its citation, the Academy said: "In the quest for the melancholic soul of his native city, [Pamuk] has discovered new symbols for the clash and interlacing of cultures." Pamuk held his Nobel Lecture on 7 December 2006 at the Swedish Academy, Stockholm. The lecture was entitled "Babamın Bavulu" ("My Father's Suitcase") and was given in Turkish. In the lecture he allegorically spoke of relations between Eastern and Western civilizations using the theme of his relationship with his father. What literature needs most to tell and investigate today are humanity's basic fears: the fear of being left outside, and the fear of counting for nothing, and the feelings of worthlessness that come with such fears; the collective humiliations, vulnerabilities, slights, grievances, sensitivities, and imagined insults, and the nationalist boasts and inflations that are their next of kin ... Whenever I am confronted by such sentiments, and by the irrational, overstated language in which they are usually expressed, I know they touch on a darkness inside me. We have often witnessed peoples, societies and nations outside the Western world–and I can identify with them easily–succumbing to fears that sometimes lead them to commit stupidities, all because of their fears of humiliation and their sensitivities. I also know that in the West–a world with which I can identify with the same ease–nations and peoples taking an excessive pride in their wealth, and in their having brought us the Renaissance, the Enlightenment, and Modernism, have, from time to time, succumbed to a self-satisfaction that is almost as stupid. Pamuk's books broke a record and sold over 200,000 copies after the announcement of his success, leading to him becoming Sweden's best-selling recipient of the Nobel Prize in Literature. 2014 The Mary Lynn Kotz Award (USA) for his book "The Innocence of Objects"
In 2005, Pamuk received the €25,000 Peace Prize of the German Book Trade for his literary work, in which "Europe and Islamic Turkey find a place for one another." The award presentation was held at Paul's Church, Frankfurt. ^ Kinzer, Stephen (15 December 1998). "A Novelist Sees Dishonor in an Honor From the State". The New York Times. Retrieved 30 August 2008. ^ "En çok kazanan yazar kim?". Sabah (in Turkish). 1 September 2008. Retrieved 2 September 2008. Husseyin, Hazim M. (2009). Nobel Ödülünün Orhan Pamuk ve Eserleri Üzerindeki Etkileri. University of Baghdad. p. 94. Pamuk, Orhan (2005). Istanbul: Memories and the City, translated by Maureen Freely. Faber & Faber p. 15 -- "My paternal grandmother was Circassian (Circassian girls, famous for being tall and beautiful, were very popular in Ottoman harems)." Karpat, Kemal H. (2001) The Politicization of Islam: Reconstructing Identity, State, Faith, and Community in the Late Ottoman State. Oxford University Press. p. 345 -- (...) such as the novelist Orhan Pamuk, who is of Circassian origin. ^ a b Daren Butler and Ercan Ersoy, "Kerinçsiz puts patriotism before free speech, EU" Archived 20 November 2012 at the Wayback Machine. Reuters via Turkish Daily News, 21 July 2006. ^ Pamuk, Orhan (2005). Istanbul: Memories and the City, translated by Maureen Freely. Faber & Faber p. 15 -- "My paternal grandmother was Circassian (Circassian girls, famous for being tall and beautiful, were very popular in Ottoman harems)." ^ Jaggi, Maya (8 December 2008). "Between two worlds". The Guardian. London. ISSN 0261-3077. OCLC 60623878. Retrieved 14 June 2011. ^ "SPIEGEL ONLINE — Orhan Pamuk and the Turkish Paradox". Spiegel.de. Retrieved 13 May 2011. ^ Peter Badge; Nikolaus Turner; Anders Barany; Chris Richmond; Wim Wenders (20 November 2007). Nobel Faces. Wiley. p. 170. ISBN 978-3-527-40678-4. ^ Jay Parini (19 May 1991). "Pirates, Pashas and the Imperial Astrologer". NY Times Books. ^ Lyall, Sarah Turkish novelist given Nobel literature prize, New York Times, 12 October 2006. ^ Becker, Carol (February 2008). "Orhan Pamuk in conversation with Carol Becker". The Brooklyn Rail. ^ Allen, Jennifer (30 June 2008). "Orhan Pamuk cancels 'Museum of Innocence'". International News Digest. Artforum International Magazine Inc. Retrieved 23 August 2008. ^ Hot Property, Films. "The Innocence of Memories". www.HotPropertyFilms.com. ^ Andrew, Pulver. "Innocence of Memories review". The Guardian newspaper. Guardian Newspaper UK. ^ Pamuk, Orhan. "Innocence of Memories". www.orhanpamuk.net. ^ Stocke, Joy E. The Melancholy Life of Orhan Pamuk, Wild River Review, 19 November 2007. ^ Huseyin, Sefik (2012). "Orhan Pamuk's 'Turkish Modern': Intertextuality as Resistance to the East-West Dichotomy". International Journal of Radical Critique. 1 (2). Retrieved 9 November 2015. ^ "orhan pamuk". YouTube. 1 February 2007. Retrieved 13 May 2011. ^ "Hürriyet — Murat BARDAKÇI-Reşad Ekrem 'cemal áşığı' idi ama intihalci değildi!". Hurarsiv.hurriyet.com.tr. Retrieved 28 January 2010. ^ Liukkonen, Petri. "Orhan Pamuk". Books and Writers (kirjasto.sci.fi). Finland: Kuusankoski Public Library. Archived from the original on 10 February 2015. ^ "Orhan Pamuk: Avrupa'ya tam entegrasyon kaçınılmaz". Zaman. 3 September 2008. Archived from the original on 14 January 2009. Retrieved 3 September 2008. ...Pamuk, ölüm tehditleri ve kendisine karşı açılan davalara rağmen İstanbul'dan başka bir yerde yaşamayı düşünemediğini kaydetti. ^ Vercihan Ziflioğlu (11 January 2012). "Pamuk has gone, says his artist lover". Hürriyet Daily News. Retrieved 26 December 2015. ^ "Pamuk officially denies Karolin Fişekçi's statements". Hürriyet Daily News. 24 January 2012. Retrieved 26 December 2015. ^ Simon Schama (16 August 2013). "Orhan Pamuk talks to Simon Schama". FT Magazine. Retrieved 26 December 2015. ^ Peuwsen, Peer (5 February 2005). "Der meistgehasste Türke". Das Magazin (in German). Tages-Anzeiger. Man hat hier 30 000 Kurden umgebracht. Und eine Million Armenier. Und fast niemand traut sich, das zu erwähnen. Also mache ich es. ^ Urus, Alper (10 February 2005). "1 milyon Ermeni'yi ve 30 bin Kürt'ü kestik mi?". Vatan (in Turkish). Archived from the original on 24 January 2013. Retrieved 2 September 2008. ^ a b Rainsford, Sarah (14 December 2005). "Author's trial set to test Turkey". BBC News. Retrieved 2 September 2008. ^ "Gergin Bir Mülakatti, Kişkirtildim". Haberpan.com. 16 October 2005. Archived from the original on 25 March 2012. Retrieved 13 May 2011. ^ "Writer repeats Turk deaths claim". BBC News. 23 October 2005. Retrieved 13 May 2011. ^ "Turk writer's insult trial halted". BBC News. 16 December 2005. Retrieved 13 May 2011. ^ "Partial reprieve for Turk writer". BBC News. 29 December 2005. Retrieved 13 May 2011. ^ Camiel Eurlings MEP leads delegation to observe trial of Orhan Pamuk, EEP-ED. ^ PEN Protests Charges Against Turkish Author Orhan Pamuk Archived 1 October 2012 at the Wayback Machine, PEN American Center. ^ Literary world backs Pamuk, NTV-MSNBC, 13 December 2005. ^ Aydin, Murat (23 January 2006). "Pamuk Case Dropped as Minister Says 'I have no Authorization for Permission'". Today's Zaman. Archived from the original on 11 October 2008. Retrieved 29 July 2008. ^ a b Hacaoglu, Selcan (23 January 2006). "Turkish court drops charges against novelist". The Independent. Associated Press. Archived from the original on 14 October 2007. Retrieved 30 July 2008. ^ a b Knight, Sam (23 January 2006). "Europe tells Turkey to drop all free speech cases". Times Online. Retrieved 29 July 2008. ^ Ersoy, Ercan (22 January 2006). "Turkey drops case against writer Pamuk". Reuters. Swissinfo. Archived from the original on 11 October 2008. Retrieved 29 July 2008. ^ Hardtalk in Turkey: Orhan Pamuk, HARDtalk, BBC News. ^ Tavernise, Sabrina. 13 Arrested in Push to Stifle Turkish Ultranationalists Suspected in Political Killings. New York Times. 28 January 2008. ^ Lea, Richard (28 January 2008). "'Plot to kill' Nobel laureate". The Guardian. Retrieved 28 January 2008. ^ Lea, Richard (28 January 2008). "'Plot to kill' Nobel laureate". The Guardian. London. ISSN 0261-3077. OCLC 60623878. Retrieved 14 June 2011. ^ "Neonationalist organizations set to protest Ergenekon trial". Today's Zaman. 14 October 2008. Archived from the original on 26 September 2012. Retrieved 22 October 2008. The police informed me about the details of an Ergenekon plot to kill me about eight months before the Ergenekon investigation fully started. The government assigned me a bodyguard. Now some papers understate this organization. I don't like talking about politics, but this is a reality. This organization exists. I have seen their plans; I have listened to their phone conversations about killing me. ^ Lea, Richard (12 October 2006). "Orhan Pamuk wins Nobel prize". The Guardian. London. ISSN 0261-3077. OCLC 60623878. Retrieved 2 September 2008. At 7–1, 54-year-old Pamuk was third favourite with bookmakers Ladbrokes in the run up to the prize, following in the wake of perennial Nobel contender Ali Ahmad Said, the Syrian poet better known as Adonis (3–1) and the American author Joyce Carol Oates (6–1). ^ Rainsford, Sarah (13 October 2006). "Pride and suspicion over Pamuk prize". BBC News. Retrieved 4 December 2008. ^ "The Nobel Prize in Literature 2006". NobelPrize.org. Retrieved 13 May 2011. ^ "Orhan Pamuk's widely acclaimed novels Snow and My Name Is Red will be published in Kannada language by Peak Platform". orhanpamuk.net. 11 October 2011. Retrieved 11 October 2011. ^ "2006 Nobel Prize-winner Orhan Pamuk to receive Washington University's inaugural Distinguished Humanist Medal Nov. 27" (Press release). Washington University in St. Louis. 13 November 2006. Retrieved 3 September 2008. ^ "Orhan Pamuk'a Legion D'honneur nişanı", Hurriyet, 2012. ^ "VMFA and Library of Virginia Announce Art in Literature Award", VMFA, 24 September 2013. ^ "Tilburg University honours Michael Ignatieff, Orhan Pamuk and Robert Sternberg with doctorates". Netherlands organization for international cooperation in higher education. 12 November 2007. Archived from the original on 27 February 2009. Retrieved 23 August 2008. ^ "Orhan Pamuk: Heyecandan uyuyamadım". Sabah daily. 14 May 2007. Retrieved 8 October 2009. ^ Office of Communications (1 November 2007). "Turkish Author Receives Honorary Degree". Georgetown University. Archived from the original on 2 December 2008. Retrieved 23 August 2008. ^ "Turning Novel Ideas Into Inhabitable Worlds", Washington Post. Tuesday, 30 October 2007. ^ Spain Ambassadorship. "Madrid university gives Orhan Pamuk honorary doctorate". Retrieved 29 June 2010. ^ Anatolia News Agency (13 May 2009). "Florance university gives Orhan Pamuk honorary doctorate". Hurriyet Daily News and Economic Review. Retrieved 29 June 2010. ^ "American University of Beirut gives Orhan Pamuk honorary doctorate". Retrieved 29 June 2010. ^ Today's Zaman (19 March 2009). "University of Rouen gives Orhan Pamuk honorary doctorate". Today's Zaman Daily News and Economic Review. Archived from the original on 1 February 2010. Retrieved 29 June 2010. ^ Anatolia News Agency (18 May 2010). "Albanian university gives Orhan Pamuk honorary doctorate". Hurriyet Daily News and Economic Review. Retrieved 19 May 2010. ^ Zaman (25 May 2010). "Yale university gives Orhan Pamuk honorary doctorate". Zaman Daily News and Economic Review. Archived from the original on 29 February 2012. Retrieved 29 June 2010. ^ Standart (11 April 2011). "Doctor Honoris Causa for Orhan Pamuk". Standart daily. Archived from the original on 4 March 2016. Retrieved 5 May 2011. ^ "Open lecture of Nobel Prize for Literature laureate Orhan Pamuk - Saint Petersburg University". english.spbu.ru. Retrieved 22 February 2017. ^ de Bellaigue, Christopher (19 March 2008). "Orhan Pamuk and the idea of the novelist", Times Literary Supplement. Wikimedia Commons has media related to Orhan Pamuk.